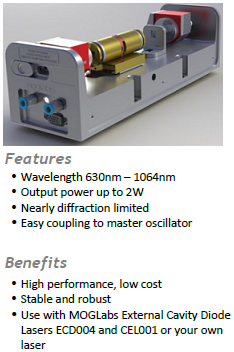 Tapered amplifiers are offered in the wavelength range between 633 nm and 1480 nm. Worldwide two companies produce tapered amplifier semiconductor chips - Eagleyard Photonics GmbH based in Berlin and m2k-laser GmbH based in Freiburg, Germany. All other companies listed above are system providers, who use tapered amplifier chips as components in their amplifier systems. Beside their amplifier systems, also single tapered amplifer chips on submount can be purchased from MOGLabs, Sacher and Toptica. Toptica acquired the majority ownership of Eagleyard in January, 2013. m2k belongs to Rofin-Sinar Laser GmbH. Following parameters are according to free accessible data from provider's website (last update September, 2014). * Eagleyard specifies divergence as FWHM of the full angle; m2k as 95 % power content. ** The seed light is coupled via a single mode fiber into the tapered amplifier. Hanel Photonics is only the distributor of MOGLabs and the data shown above from other companies is for information only. Hanel does not guarantee the correctness or completeness of the data.